When the road points skyward, you need extra horsepower to overcome Earth's gravitational pull. One guaranteed way to get to the summit faster is to strengthen your climbing muscles (including quads, glutes, hamstrings, and calves). In a recent study, when riders performed cycling-specific moves, they improved their maximum power in 30-second sprints and 40-minute time trials, and boosted their peak aerobic power output--a key indicator of climbing success. Here's why: Weight training not only adds new muscle fiber to your arsenal, it also strengthens the fibers you use for endurance efforts (yep, climbing) so they become more resistant to fatigue. Translation: You can pedal uphill for longer before your legs declare mutiny. The following moves will help turn your four-cylinder engine into a high-powered V8. Do two to three sets of 10 repetitions, with two minutes of rest between sets. Choose a weight that is challenging enough that you can complete all the reps, but no more. For the best gains, aim to do the workout twice a week for at least six months, then once a week to maintain your power. Hold a bar behind your neck or dumbbells at your shoulders and stand with your feet shoulder-width apart. Keeping your back straight, bend your hips and knees as if you were sitting on a bench. Lower yourself toward the floor until your thighs are parallel to the ground, then push yourself back to the starting position. In a leg-press machine, position your right foot slightly to the right of center on the platform. Bend your knee and lower the sled until your leg is bent 90 degrees. Push back to start. Finish the full number of reps, then switch sides. Hold dumbbells at your shoulders, palms in. Stand facing away from a chair or bench and extend your right leg back, placing the top of your foot on the surface. With your back straight, bend your front leg until your thigh is parallel to the floor, or as close as possible. Press back to start. Finish the full number of reps, then switch sides. Stand in a Smith Machine (a squat rack with guide rails) with the bar across your neck, and with the balls of your feet on two large weight plates. Let your heels hang off the edge, then lift them until they rise above the plates. Return to start. 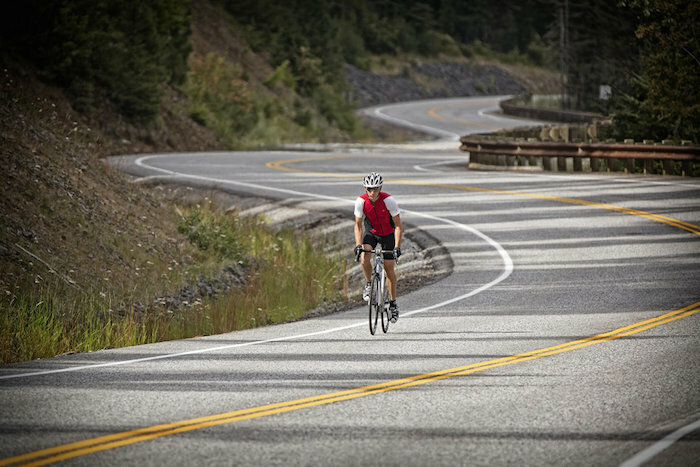 When I'm on a long climb, I'll rotate through my muscle groups to give some a break while others are on duty. So I might scoot back on the saddle for a few minutes to engage my glutes, then forward to call on my quads. Next, I stand for a few seconds to stretch before repeating the sequence. When the going gets really hard, I'll switch between my legs and lungs, spinning an easier gear at a higher cadence for a few minutes to let my muscles recover, followed by a larger gear at a lower cadence to give my aerobic system a rest. Throughout it all, I sync my breathing to my pedaling, inhaling for three revolutions and exhaling for two--it's a simple trick that controls my breaths and calms my mind even when my legs are screaming and my heart is pounding. Dog + Bike = Stoke!